27 November 2016 – Today, the family and I journeyed to Melbourne to visit a couple of backyard urban gardens, one of which was running a tree propagation workshop as part of it. In this post, I share with you the basics behind tree propagation. On the car ride to Melbourne, we listened to a podcast by Jack Spirko as a refresher on the basics of tree propagation. We had learned about and practiced tree grafting before, but some time had passed and we thought a refresher would be a good way to pass the time on the drive. Basically, there are three primary ways trees can reproduce: from seed, by grafting, or by rooting. Here is a very basic introduction to each method given my limited experience. The most obvious way to grow a tree is by planting its seed. Depending on the type of tree, it isn’t always as simple as just sticking the seed in the ground and waiting for it to grow. Some seeds require help through stratification (simulating winter conditions) or scarification (weakening the outside coating). Assuming you can germinate the seed in your climate, there are a few advantages and disadvantages to growing a tree from seed. One disadvantage is that your involvement takes longer. You have to be that person to go through the trouble of germinating the seed and raising it through its first and most fragile years of its life. This means you have to wait longer to establish your orchard. However, there are two big advantages. Not only will the root system will be much stronger, but it will also better integrate to your exact climate and soil conditions. This all means the tree will be healthier, stronger, and more resilient. Besides time, there is one major disadvantage to raising from seed, particularly when it comes to growing fruit trees. Because of the genetic diversity found in seeds (made when one male and one female tree like each other very much) it is nearly impossible to know what you are going to get. In the case of apples, there is about a 1 in 10,000 chance that you will get a tree that produces fruit “true to type.”  Most of the fruits we enjoy were specific genotypes discovered by accident. For example, the Granny Smith Apple was discovered by accident when an old Australian lady – Granny Smith – inadvertently discarded an apple seed in the back yard that later spontaneously germinated and just so happened to produce a great tasting apple. However, more often than not, an apple seed will create an apple tree that isn’t so great. The only way to guarantee you get the great tasting apple you want is to clone the tree, and to do this you need to use one of the other two methods. 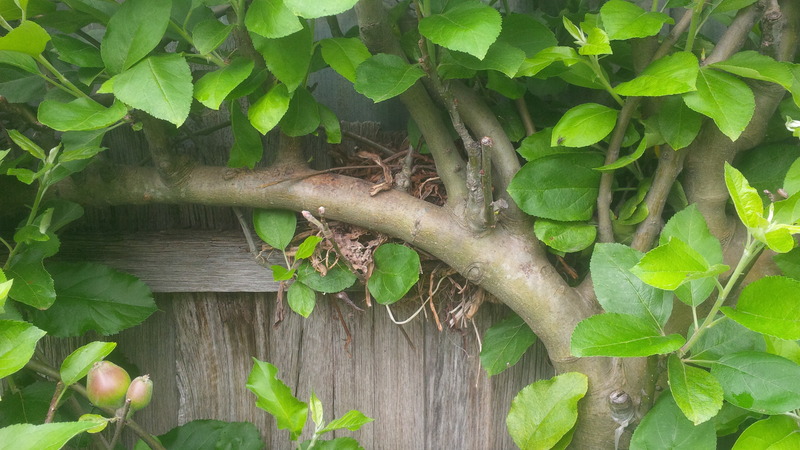 In Bill Mollinson’s Permaculture Design Manual, he discusses in chapter 6 how each new growth on trees has the propensity for random mutation and that, as such, one tree might actually become over time an interconnected grouping of genetically unique branches. Similarly, you can actually transplant a branch from one tree to another, usually provided they are both of the same species. 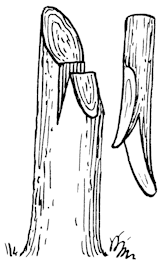 The grafted branch will fuse to the new tree and become part of the whole, even though it is from another genetically unique tree. In effect, that branch will become an exact clone of the original parent tree. When grafted near the base of the tree, it essentially becomes an entire tree that is a clone of the parent. The transplanted branch is called the scion and the recipient tree is called the root stock. Although the root stock normally has to be of the same species as the scion, it by no means has to be the same variety. Indeed, the fact that it can be from a different variety is one of the advantages of grafting vs growing from seed. Although many fruit varieties produce excellent tasting fruit, they do not always have the strongest root system, resistance to infection, and/or general overall vigor. Therefore, you can give yourself the best of both worlds by grafting a variety of fruit that has a known taste onto a variety of root stock that has a known vigor. For the home orchard, it might make sense to pick a root stock that has high resistance to parasites and infection. For a commercial orchard, it might make sense to pick a root stock that produces a highly consistent height and shape tree (for large scale harvesting). If left to grow, root stock will essentially become a full fruit-producing tree, although the fruit might not taste good. 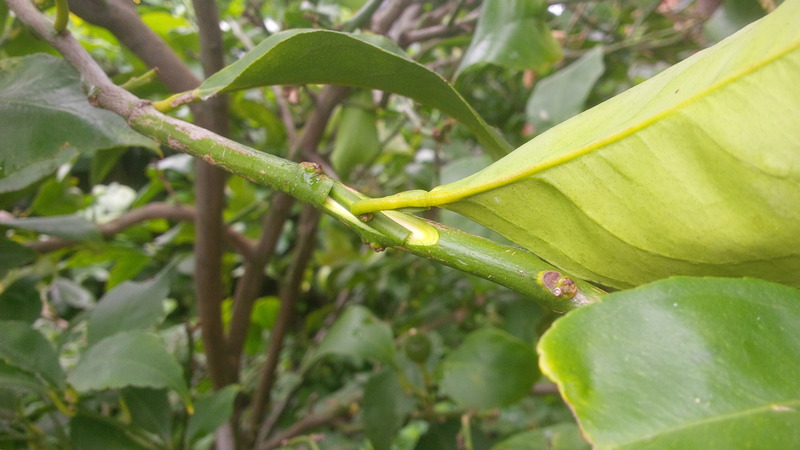 Sometimes, people can’t figure out why their lemon tree is producing such bad lemons when what they don’t realize is that somewhere along the line the grafted portion of the tree may have failed or simply been overtaken by the original root stock. To solve the problem, the “bad” portion would just need to be removed and a new scion grafted onto it. The cambium layer (the live green layer in between the bark and the wood) must be the same size in both the root stock and the scion. These layers must overlap so that sap flow moves freely between scion and root stock. The scion cannot be bigger than the root stock. In fact, it may be preferable for it to be slightly smaller. The graft site must be kept moist, so is usually wrapped to not only keep them lined up properly, but to keep them from drying out. The possibilities are somewhat endless. Grafting can be used simply for planting one new tree, but it can also be used to put multiple varieties all on the same tree. In the garden where the workshop was held, one tree actually had 130 different varieties of apple all growing on it! Additionally, you can train and shape the tree however you like. In the picture at right, several varieties have been grafted in such a way that the tree sits flat against a fence wall, with individual varieties coming up vertically off the main branch. If you look closely at the bottom of each branch, you’ll see the scaring of where the graft was originally made. Although most time was spent discussing the whip and tongue cut, there are several other types of grafts. The only other one demonstrated at the workshop was the “budding” method. 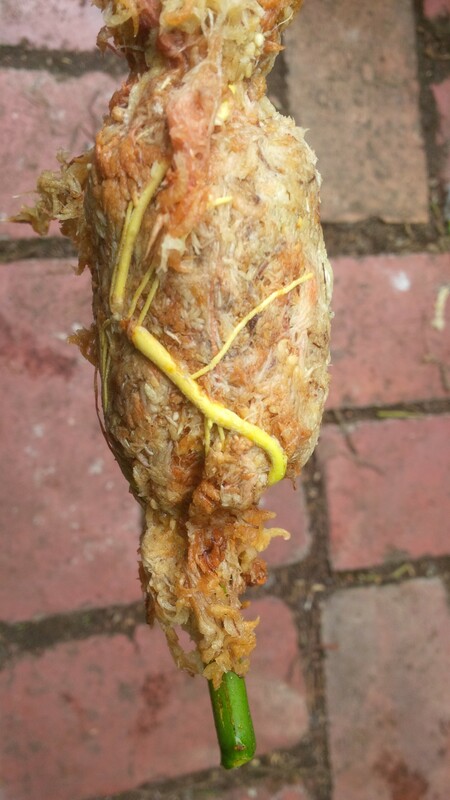 Under this technique, a leaf and its bud connected to a piece of the branch is removed and then attached to the root stock. Again, it is critical that the cambium layers overalap. In this example, he actually staggered the scion so that the cambium layers overlapped on both the upper-right and lower-left corners of the scion. Eventually, this one little bud could grow into a new branch or entire new tree. Take a sharp knife and peel off a 2 cm (1 inch) segment of bark and cambium so that only the wood is remaining. Rough up the surface of the exposed wood so the hormones can better adhere. Soak a bunch of sphagnam moss (used as a rooting hormone) in water, squeeze it so it’s just moist, and apply a healthy handful of it around the exposed wood. Alternatively, a tea made from weeping willow can be used in lieu of water, as this is known to be a strong rooting hormone. Wrap the sphagnam moss in plastic and tie it tightly at top and bottom so that moisture is retained. Cover the plastic-wrapped moss in aluminum foil so it stays warm and does not dry out. 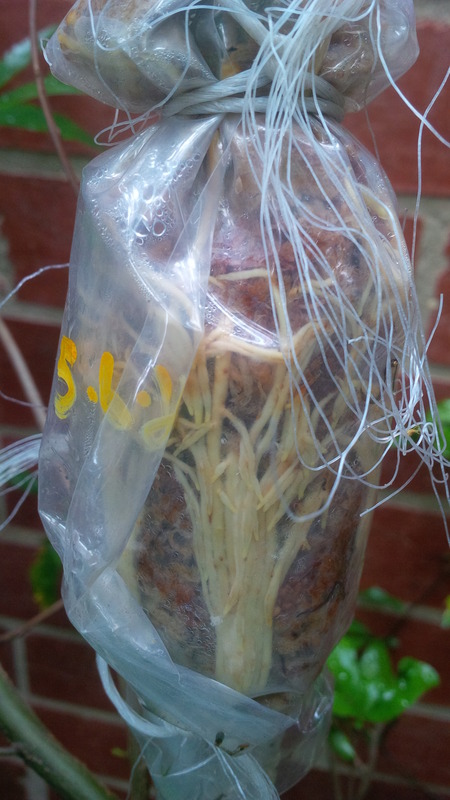 About six months later, the roots should be visible through the plastic. Cut the branch off below the rooted area and hydrate it in a bucket of water. Remove the plastic, hydrate again, and plant in a pot without disturbing the moss and roots. Lay a stick across the pot and tie the root to it to prevent it from falling over. Spray daily with a mixture of water and seaweed. Of course, aerial layering is but only one of many methods of rooting. Jack’s podcast outlines a few others, but is still just an intro. There are so many methods of rooting (and grafting) and I’m just scratching the surface on learning the basics. The biggest thing I took from this workshop was that this is not rocket science. Although I still have much to learn on the subject, my preliminary thoughts are that I will select a root stock for my fruit trees that is highly resistant to infection, plant them myself to take advantage of the stronger root system, and then graft specific varieties to those root stocks. This should provide the best of both worlds. I also think it would be a smart idea to let a couple of the root stocks grow to a full-sized tree so that I have a source of root stock in the future if I ever need it. It doesn’t seem like dwarf trees are worth it, since any size tree can be pruned to the desired height and, as Jack Spirko describes in his podcast, dwarf trees limit the growth of the tree by using a root system that is purposefully not as strong. I look forward to eventually building my own orchard and food forest. In the mean time, I will continue to educate myself on various techniques as well as start to build muscle memory by practicing different types of cuts.